A motorcycle is the most dangerous type of vehicle to drive. Motorcyclists face extreme danger when they crash and are far more likely to be injured or die than people in trucks and cars. And the danger is increasing. The Institute for Highway Safety reports there were more than twice as many fatal motorcycle wrecks in 2013 as there were in 1998. When motorcycle riders get in accidents, more than 95 percent of them are injured in some way, and 45 percent involve a serious injury. In a seven-year period in the 2000s (2001-2008), there were more than 1.2 million motorcycle-involved injuries on U.S. roadways. 1. Go the Speed Limit, and don’t Drink: While motorcyclists are often in danger of crashes with other drivers, the danger is just as great when they don’t have a collision. The Institute for Highway Safety reports that just as many motorcycle crashes occur when there is no other vehicle involved as when there is. In 2013 motorcyclists were speeding in 46 percent of single-vehicle crashes, and about 40 percent had blood-alcohol content above 0.08 percent. Speed is a factor in about 32 percent of all motorcycle fatalities, the Insurance Information Institute reports. 2. Make yourself Visible: Don a safety vest with reflective striping or made in neon colors. Also, consider buying a strobe-light modulator that makes your headlight flash intermittently so you really stand out, even in daylight. 3. California has a Universal Helmet Law: everyone riding a motorcycle must wear a helmet the entire time he is operating the machine. The U.S. National Traffic Highway Safety Association estimated in 2008 helmets saved the lives of almost 2,000 motorcyclists, and another 800 could have avoided death. Full-face helmets are the safest. These helmets, which include a chin guard, are approved by the U.S. Department of Transportation. 4. Many people who ride motorcycles are tough, rugged individuals. But no matter how strong they are, their skin is little tougher than a newborn baby’s skin. Motorcycle safety experts strongly recommend wearing boots and other motorcycle apparel to protect against road rash. Motorcycle boots help protect against burns from the exhaust pipe and keep toes safe if you accidentally kick the ground. Thick gloves and leather chaps and jackets can help protect your skin if you have the misfortune go scraping across the pavement. 5. Practice sudden braking and steering in a parking lot when no one else is around. Car and truck drivers need simply turn their steering wheel and apply the brakes to avoid a collision. But for a motorcyclist to avoid a crash, it’s more complicated. They have to twist their bodies and find the perfect balance between steering and braking to avoid sliding or being thrown over the handlebars. 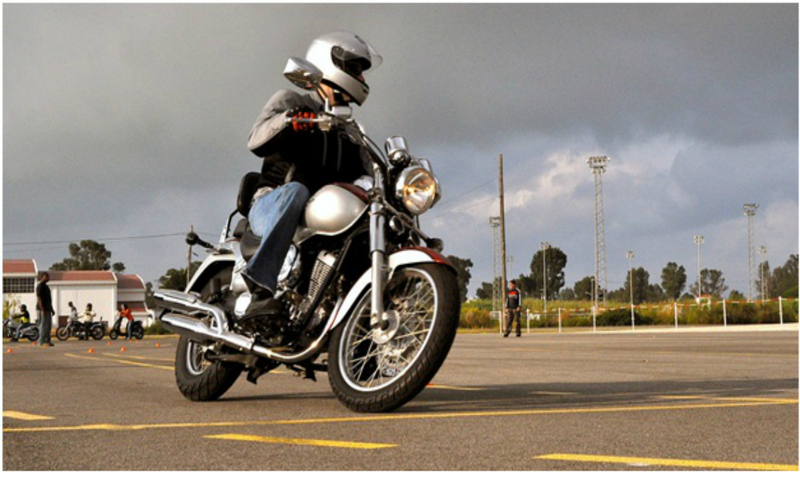 Riders who practice get to know the heft and maneuverability of their bike, and practice in the parking lot can only help them get more familiar with their motorcycle. 6. When another vehicle is involved, most motorcyclists don’t cause the crashes they get into. Other motorists are at fault in multiple-vehicle wrecks about 70 percent of the time as they maneuver into motorcyclists’ right of way or even smash into them. Navigating intersections is especially dangerous. Be alert and look at all parts of the crossroad, taking care to slow and be hyper-careful if it looks like an oncoming driver is about to turn left. 7. The Motorcycle Safety Foundation advises people to SEE when they bike—search, evaluate, execute. A car driver may have some leeway if his mind wanders a bit, but for a motorcyclist wandering attention can result in a painful, disabling wreck. Continuously look at and evaluate traffic and road conditions. Assess potential problems or risks. Keep your mind and eyes on the job of riding safely the entire time you are on your motorcycle. Krasney Law has expert attorneys in California motorcycle-accident law in San Bernardino and Redlands. If you’re injured in a motorcycle wreck, call us to set up a free consultation with an Inland Empire motorcycle-law expert on how to proceed with your insurance company and whether you should seek compensation in court.